We departed New York on the morning of 4/9/11. We had a long cross country drive of over 2,500 miles. I am used to this, but it was the first Eddie had driven to Arizona since he and Steve Brown had done it in 1979! We made good time each of the three days with the only problem at St. Louis Missouri the first day. We arrived to find the bridge across the Mississippi closed and a forty mile detour at 9 pm. Oh well we got there. As we crossed the country, western species were seen along the way. Many Scissor-tailed Flycatchers, a Pinyon Jay, a Prairie Falcon, Cattle Egrets and many others that would be seen in Arizona were encountered. We arrived in Sierra Vista around 2pm on 4/11. We immediately started seeing great birds including a Zone-tailed Hawk, Swainson’s Hawk and many hummingbirds. We settled into our cabin and then went and got supplies at the store. Upon returning to the cabin we watched the feeders while we relaxed after our exhausting drive. At the hummingbird feeders we saw Magnificent, Rufous, Anna’s, Black-chinned and Broad-tailed Hummingbirds. Within a short time, our first Calliope and then a beautiful Broad-billed Hummingbird came in. We had at least 15 hummingbirds coming in all. At the regular feeders, we had several Lazuli Bunting, Mexican Jays, Acorn Woodpecker and Chipping Sparrows. An Arizona Woodpecker soon joined the group and a Painted Redstart came through. At then end of our first (partial) day, we had already seen over 30 species. The next morning I was up early. The neighbors told us that masses of mixed species work their way up the canyon in the morning, passing right by our yard and driveway. I was not disappointed. Yellow-rumped, Orange-crowned, Lucy’s, Wilson’s and a Nashville Warbler were all seen. Non-warbler species included Bewick’s Wren, Scott’s Orioles, Hepatic Tanager and Black-headed Grosbeak. Pine Siskins were everywhere, with an occasional Lesser Goldfinch mixed in. My first goal on 4/12 was to try for LUCIFER’S HUMMINGBIRD at MaryJo Balator’s B + B. It only took a short time and I had stunning looks at this gorgeous life bird. I would get to see it at least five more times on this trip. Other great birds included Ladder-backed Woodpecker, Hooded and Scott’s Orioles, Gila Woodpecker and Lazuli Bunting. That evening, I decided to see if any owls were around. I couldn’t believe how many owls there actually were. Harry Gabbert, our host, told me there are many owls in the canyon and he was certainly correct. In the first hour after dark I had seen and heard at least six Elf Owls and one Western Screech Owl. I went out a little later to see if they were still calling and immediately heard the first Whiskered Screech Owl of the trip. I got out the light that Arlene Borko had loaned me for the trip, and found the owl sitting on a snag right in our driveway. The next night, he perched right over our patio in a tree. The Elf Owl show went on every evening of our entire stay. The next day, 4/13, I went to Beatty’s Guest Ranch and hiked up Miller Canyon. Tom Beatty informed me the Spotted Owl had been seen the day before and gave me directions to get to it. I hiked up as did many others that day, but none of us found the owl. More Painted Redstarts, many empids, Mexican Jays, Lucy’s, Black-throated Gray and Townsend’s Warblers as well as others were seen. At the controlled access site, I saw many of the same hummingbirds that I have been getting at my own feeders. On 4/14, I drove to Patagonia and the Paton’s Home. Since my last visit, Marion Paton has passed away, I am so glad I got to meet her the last time I was here. There were many hummingbirds at the feeders, but I missed the Violet-crowned Hummingbird. Canyon Towhees, Abert’s and Green-tailed Towhees were all seen. Inca Doves, Lark Sparrow, Gambel’s Quail and my first Costa’s Hummingbird of the trip were seen. From there I went on to Montosa Canyon where I found my second lifer of the trip, BLACK-CAPPED GNATCATCHER! The pair was easily found and the identification was easy as well. The white undertail and black cap on the male combined with their calls which were quite unique eliminated both Blue-gray and Black-tailed Gnatcatchers. Also in the canyon were many Black-throated Sparrows, Western and Cassin’s Kingbirds and Bushtits. On to Madera Canyon. It was relatively quiet since it was now near noon. A few orioles, hummingbirds, turkeys, and woodpeckers were all I saw. From there I went to Pena Blanca Lake where I easily found the Least Grebes that had been reported. On 4/15 I drove up Carr Canyon. This was a great day. Many hawks were seen as I braved the hairpin turns, gaining in elevation as I went. Zone-tailed, Cooper’s and Swainson’s were among them. As I neared some of the high elevation forests, I found many Yellow-rumped, Orange-crowned and Wilson’s Warblers. Among them were the occasional Grace’s and Virginia’s Warblers. At the Reef Townsite Campground, I found several Buff Breasted Flycatchers. More of the common warblers were seen, then paydirt. I heard a song that was unfamiliar to me, I followed the sound and found high in a conifer a beautiful OLIVE WARBLER. I had seen the species before in Mexico, but this was a new ABA bird for me. As I traveled further up, I encountered my only Greater Pewee of the trip. Other birds seen included two nice Hermit Warblers. My first Spotted Towhee of the trip was here as well. On 4/15, I birded the area around the Hereford Bridge on the San Pedro River. I had heard that the area is good for thrashers and I had three target thrashers on my wish list. I had a tremendous number of birds at the river. Green-tailed Towhee, Gambel’s Quail, Dusky, Cordilleran and Hammond’s Flycatcher were all seen as well as big numbers of Pacific Slope Flycatcher. Many of the empids went unidentified due to their silence and similarity to other species. 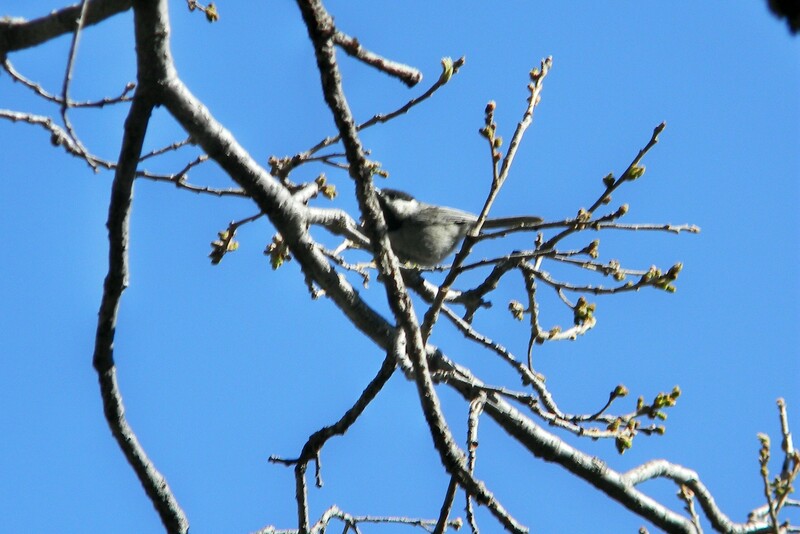 Bewick’s Wren, Verdin, Ash-throated Flycatcher and Pyrrhuloxia were all seen. I had a number of Curve-billed Thrashers, which were common everywhere, but none of my target thrashers. At the San Pedro Inn, I found a previously reported White-tailed Kite. Beautiful bird. Also of note were many Lark , White-crowned and Vesper Sparrows. Overnight there had been a tremendous flight of flycatchers, as evidenced along the river and several Vermilion Flycatchers at the Inn. I returned to the cabin for some R and R and found the highest number of hummingbirds were coming to the feeders on the trip thus far. At least 30 hummingbirds were feeding in a frenzy. At least 4 Magnificents, 3 Rufous, 4-5 Anna’s, 10+ Broad-taileds, 2 Broadbilled, 1 Black-chinned, 3 Calliope and finally a gorgeous male COSTA’S HUMMINGBIRD! This was hummingbird nirvana! Not to be outdone, the owl show continued after dark. At least 5 -6 Elf Owls were calling and two could be seen right over our driveway with the use of the light. The Whiskered Screech Owl sat right over our patio. Today 4/17 hasn’t been quite as birdy, but it did have its highlights. I had to scrap my plan of going to the Chiricahuas this morning due to a bulge in my tire which I can’t get checked out until the morning. Instead, I remained in the area and did a couple of spots again. I spent most of the morning at MaryJo Balator’s place watching hummingbirds. The male LUCIFER HUMMINGBIRD was very cooperative and many got to see it. It came twice while I was there, what a bird! Next I went back to the San Pedro River Inn where I added a nice Yellow-headed Blackbird for the trip. Here at the cabins, the Painted Redstart was more cooperative with photo ops today, hopefully one turned out. By the way, Avis Car Rentals policy on a bad tire is to change the car! They drove a flatbed out 85 miles with a new car, rather than have us drive the car or have the tire changed. Oh well. Back at the Cabin, our neighbor and fellow birder John from Colorado was visiting when he noticed something in the gulch next to the cabin. In came a mother Collared Peccary with her baby. We understand she has two, but we only saw one today. I was able to get a couple of pics. We have lots of wildlife at the cabins. At least 8 Coo’s deer come in daily, one Raccoon, 10 Turkeys, and both Gray and Rock Squirrels. On Monday 4/18, Eddie and I got up early and headed to the Chiricahua Mountains for more of my target species for the trip. We decided to head up rt 186 and cross over the Chiricahuas at Onion Saddle, 7,600 ft. It was a bumpy but scenic ride. Right at Onion Saddle, at the turn off for Rustler Park, we found a large mixed species flock which contained 4 MEXICAN CHICKADEES, Black-throated Gray Warblers, Orange-crowned Warbler, Bushtit and Ruby-crowned Kinglet. 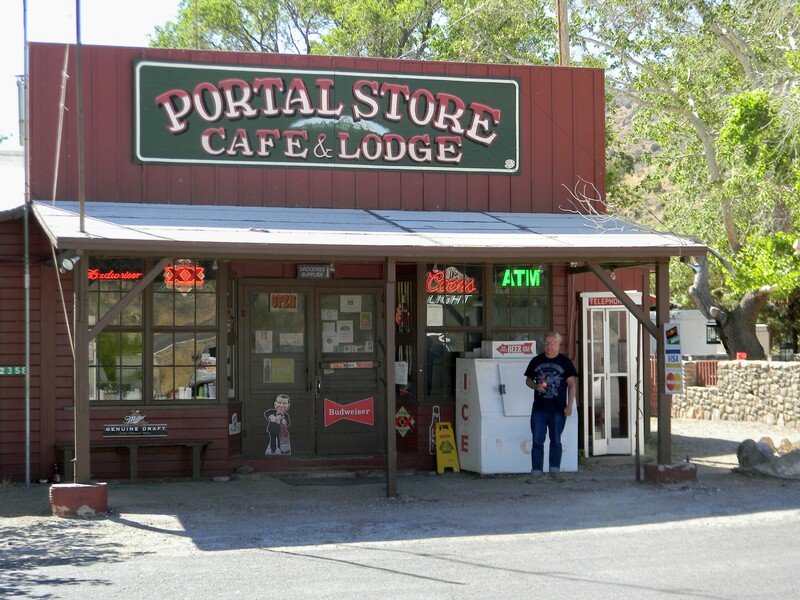 We then went on to Portal. We birded many great locations, but failed to find either Crissal or Bendire’s Thrashers. Dave Jasper’s feeders were very active. Curve-billed Thrasher, Green-tailed and Canyon Towhees, Pyrrhuloxia, Sharp-shinned Hawk, Scott’s Oriole and many more were seen. We birded all recommended areas, including Willow Tank, Rodeo Dump, Gin Road etc. On the way home, we hit Cochise Ponds in Willcox. An abundance of waterfowl and shorebirds included: Cinnamon, Blue-winged and Green-winged Teal, Northern Shoveler, Ruddy Duck, American Coot, American Avocet, Black-necked Stilt, Least Sandpiper, Killdeer and Wilson’s Phalarope were all seen. Today, 4/19/11, was supposed to be a down day. Eddie and I were both exhausted after our 300+ mile roung trip to the Chiricahuas yesterday. This morning I decided to go visit the feeders at MaryJo Balator’s. I couldn’t resist the chance to see the Lucifer Hummingbird again. We ended up seeing the male LH twice in the next hour. What a bird! After our visit with MaryJo, we did some errands and headed home. After a nice lunch, I walked up to the Nature Conservancy Preserve. Nothing new or special there. I returned home, and watched the feeders. I was back in the cabin when Eddie alerted me to a huge hummingbird at the feeders. By the time I made the door, it was flying away, chasing another hummingbird. All I could see was the bird from behind, but I exclaimed it had to be a Blue-throated Hummingbird. The reason was simple. From behind, the bird had huge white tail tips. I had seen all the other species and knew that only the female Magnificent had white tail tips similar to what I was seeing. The thing is, the female MH’s white tail tips are small in comparison with a male Blue-throated’s. I was sure it was a BTHB. Within twenty minutes, the adult male BLUE-THROATED HUMMINGBIRD returned to the feeders, giving great looks! It would return one more time during the hour, as dusk set in. Hopefully, it will return tomorrow, offering me some photo opts. The extra neat thing that happened was, as I watched for the hummingbird, Eddie said “John, a vulture is right over the yard”, I looked up and was thrilled to see an adult GOLDEN EAGLE circling right over our yard!! Eddie had in effect found me two new trip birds right in the yard! This brings to 9 the number of species of hummingbirds in the yard and 10 the number of species for the trip. The day started early on 4/20. I awoke at 2 AM to go to the bathroom when I thought I heard an owl call. At first it didn’t repeat, and I thought I was hearing things since owls are going all the time here. When I got back to bed, it called again and I dressed and went outside. The full moon made it a beautiful scene. The first thing I noticed was several Common Poor-wills calling. These were the first I had had here at the cabins. Then the owl called again. Great Horned Owl. First on the trip, and bringing to four the species I’ve had here at the cabin. Not ever to be left out, two of the Elf Owls began to chatter at the edge of the drive. Back to bed, but up early again, Eddie and I drove to the Paton’s in Patagonia. I had missed the Violet-crowned Hummingbird here last week, but our neighbor got it the next day and said it is comming a little more regularly. When we arrived, we were told it had been there a short time before, but is quite sporadic. Not to worry, in five minutes it came in, giving good views to all present. I got my usual distant shot, but glad to have it. This morning, 4/21, I decided to head over to White-water Draw Wildlife refuge to try for Thrashers. Both Crissal and Bendire’s had been reported in the last few days from this spot. It is a great birding location. In the middle of desert grasslands, it is a water oasis. I was happy to see two Curve-billed Thrashers right off the bat, as it meant thrashers continue that were reported earlier in the week. It didn’t take long and I had my life BENDIRE’S THRASHER . I had great scope looks and the bird was cooperative for several minutes. I added many new state and trip birds here. Other great birds included 55 White-faced Ibis, 1 Solitary Sandpiper, 1 Sora, 5 Vermilion Flycatchers, 4 Western Kingbirds, 1 Northern Harrier, 75 Lark Bunting, 2 Brewer’s Sparrow, 6 Lark Sparrow, 1 Savannah Sparrow, 3 Cinnamon Teal, 3 Vaux Swift, 5 Northern Shoveler, 1 American Coot, many Warblers including Wilson’s, Orange-crowned and Yellow-rumped, 4 Curve-billed Thrashers and assorted Killdeer, Least Sandpiper, Say’s Phoebe’s etc. The non-avian highlight of the morning was 2 adult Bobcat! They hunted and cavorted, but I could not get a pic of them together. What a great day of birding I’ve had over the last 24 hours! First, Mary and Shep Harris from Colorado stopped by yesterday to check out the cabins. Nice people and birders to boot. We ended up trying for owls last evening, and got Mary her life Whiskered Screech Owl at the Ramsey Canyon Preserve just up the road, and then 4 Elf Owls here at our cabins. Its always great to help someone get a lifer. Then this morning, I met Mary and Shep at Miller Canyon. They had gone up day before yesterday and gotten their life Spotted Owl and were sure they could show me the right spot, as it had been marked by the Beatty’s. We hiked up to the spot, but no owl was to be found. They finally pulled themselves away, as they had other plans to keep. I continued hiking up the trail, and eventually met some local birders who were on a nice mixed species flock. Red-faced, Townsend’s, Grace’s, Black-throated Gray and Orange-crowned Warblers, Painted Redstart, Red-breasted Nuthatch etc. As we finished watching the birds, they asked if I had seen the owl on the way up. I said no and asked if they had. They said “yes, we can take you right to him”. Thats exactly what they did. My life SPOTTED OWL!!! This has been a long time coming. Another great bird! They went on with my many thanks! I continued to bird up the trail. It seemed like there was one great bird after another. I had 25 species on the trail alone. Besides the owl, other great birds were 5 Red-faced Warblers, 3 Stellars Jays , 1 Olive-sided Flycatcher, and a array of warblers made it a great hike. As I neared the top of the trail near tub spring, I was on a steep section of trail with a drop off to my left and steep incline to my right. As I leaned in shuffling along, I was started by the distinct rattle of a ROCK RATTLESNAKE right next to my side two feet up the incline to my right. I stepped back quickly, and fortunately the snake was not coiled, so it couldn’t strike. I took many pictures of this snake which was a lifer for me as well. On the way down, I showed the pictures to a ranger who informed me that it is a rare snake and I was very lucky to have seen it. He also informed me a cinnamon Black Bear had just crossed the trail below us, but I never got to see it. This trip has just been fantastic! This morning, 4/23, I decided that since I had exhausted all locations in southeast Arizona for Crissal Thrasher, I would return to the spot they were most recently seen. White-water Draw. I left early, so as to arrive before the sun was up, but that didn’t happen. I got to Double Adobe Road at around 6:30 am and after a couple miles, I noticed a thrasher fly up to a telephone poll. I stopped and found a Bendire’s Thrasher on the poll. There was also another one across the street, singing on top of a Mequite Bush. I got a couple of pictures and started on only to find more Bendire’s a short distance up the road. By the time I reached White-water, it was 7 am. As I pulled into the parking lot, a pair of CRISSAL THRASHERS flew right in front of my car. I knew they were Crissals, due to their banking away from the car and seeing their rufous undertail coverts as they passed. I immediately parked and followed the birds around taking photos as they went. I then started around the preserve and found a very late Sage Thrasher! I had a great time here once again, new birds seen included a Greater Yellowlegs and a Bank Swallow. 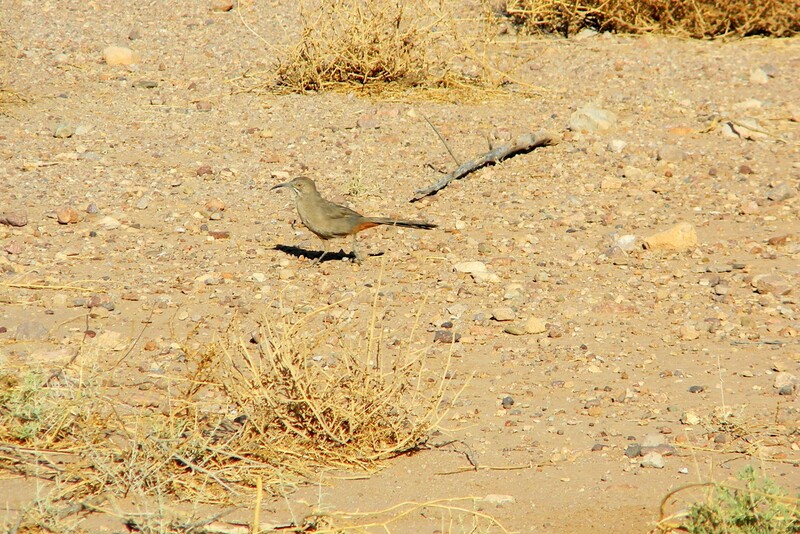 On my way back out on Central Highway I found a pair of Curve-billed Thrashers! I don’t imagine I will ever have four Thrasher species in my lifetime again. What an experience! I stopped back at MaryJo Balator’s to see the Lucifer Hummingbird again, he didn’t come in, but the first female Lucifer’s I have ever seen did. Great morning! Sunday 4/24, our last full day in Arizona. I decided to go back to the Paton’s feeders and try for a picture of the Violet-crowned Hummingbird. I got the best shot I had so far, so I was pleased. I also added several new species for the trip including Great Blue Heron, Thick-billed Kingbird, Western Tanager and Phainopepla. This afternoon – relaxing and packing. We leave for home tomorrow morning. Notable things about this trip: I had 11 species of hummingbird, tieing my record from 2007. I added 5 life birds: Crissal Thrasher, Bendire’s Thrasher, Spotted Owl, Lucifer’s Hummingbird and Black-capped Gnatcatcher. I added two new ABA only species: Mexican Chickadee and Olive Warbler. John, I can’t believe how well your doing in just the first few days! The pictures are great. Good luck with the owls and I’ll keep checking your blog on a daily basis. John: sounds like a great trip so far! What an impressive list already. I’m most envious especially at the wonderful variety of hummers you’re getting at your feeders. Good luck on your target owls! John, it sounds like your doing great with the exception of the tire situation. The pictures are terrific and I look foward to your daily posts! It has been a wild week! Tough for you to get lifers; you did very well. Lucifer and Magnificent hummers are great. Never saw Spotted Owl (kind of by choice) or Bendire’s Thrasher. I though Black-Capped was pie-in-the-sky and didn’t really try. Love it out there. And I NEVER saw Red-Faced Warbler!! We chased a singing one for an hour, but never saw it. Sometimes I think I’m too ethical. Enjoy . . talk to you soon.